STREET STYLE—Rinlada Herana poses in a way that she says reflects her dancing. Her style she says is inspired by the dance she loves so much. Just a girl standing in a studio, alone. She closes her eyes and paints a picture. Then she begins to dance, her movements reflecting the image she imagines. Through dancing, freshman Rinlada Herana has just brought the painting in her head to life. “I’m always dancing and whenever I hear a song with a good beat I can’t help myself but dance,” hip-hop artist Herana said. Herana is a dedicated dancer who trains multiple days a week in classes up to eight hours long. Her dedication has proved worthwhile as she is an advanced dancer known around her studio for her artistry and work ethic. “She always has a strong determination when she is either dancing or choreographing; you can see her hard work shine through her dancing,” Herana’s friend Olivia Lample said. Beginning when she was 10 years old, Herana’s love for dancing has skyrocketed over the past five years. Though many dancers begin at an earlier age, her dedication and love for hip-hop drove her to advance at a rapid pace. “At first, it started as just something that I do for fun and something that I can do to pass my time with, but now dance has a new meaning in my life,” Herana said. Through dance Herana has made many lifelong friendships with dancers who have helped and continue to help her perfect her art. “I don’t know a single person who works harder than her. She is constantly perfecting her craft and somehow always improves herself and impresses everyone,” said Alex Pfalzer, Herana’s friend of six years. But her dancing hasn’t always been supported by her parents. While Herana’s father believes that she should be expressing herself through hip-hop, her mother sees it as a hobby that should come second to everything else in her life. My dad supports me, but I can’t say the same with my mom because she doesn’t think that dance will get me anywhere and she wants me to have a better life than she had. I completely am thankful that she’s looking out for me, but I would rather struggle in life doing what I love to do than to just live a life with no meaning or passion,” Herana said. Her mother’s beliefs have not slowed Herana down as she continues to glide through high school maintaining a healthy balance between school and dance. “I try to finish all of my work the day that I get it so that I have time to dance and not stress about my school stuff. I would like to dance more in the future, but that all solely depends on how I progress in school,” Herana said. 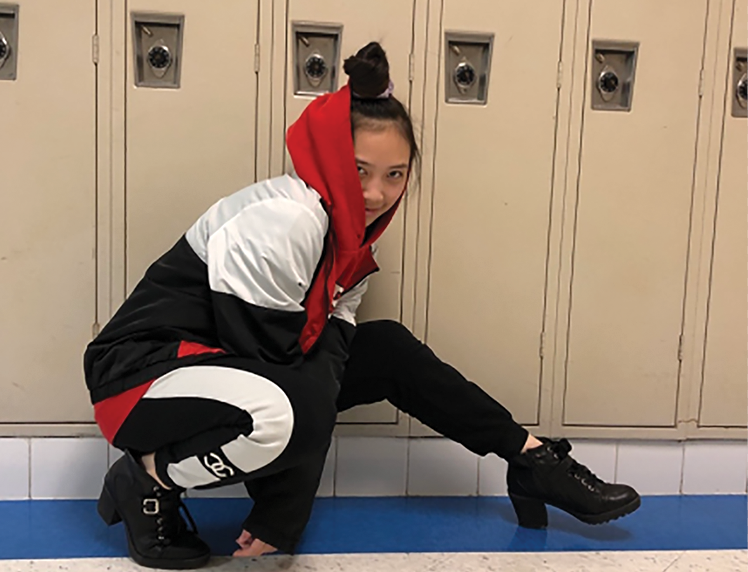 As for the future, Herana plans to continue to dance, wanting to take her passion for expressing herself through hip-hop and turn it into a career. “I would like to have dance as my career, as in dancing with A-list artists, and being a choreographer,,” Herana said. Herana is a committed, dedicated artist who just wants to be herself and do what she loves. She wants to inspire, she wants to show the world who she is, but most importantly, she wants to dance. “I love to dance because I can express myself through my movement and speak with my body. If you don’t like what I have to say, then don’t listen to me, but I’m still going to speak my mind,” Herana said.